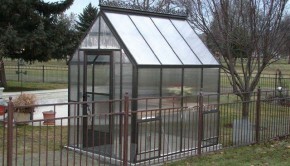 A common problem for a greenhouse during the summer months is overheating. 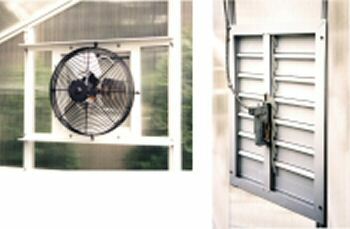 To keep the air fresh and cool, the proper balance of shading, ventilation and humidity is necessary. To protect the greenhouse from excess sun during the most intense hot hours of the day, shading practices should be implemented. The amount of shading depends on the local climate, the type of greenhouse and the necessary light conditions suitable for specific plants. Covering the roof of the upper half of the south wall is the most basic way to ensure shading but be careful not to overdo it. Too much shading can cause plants to grow more slowly or to grow reaching for more light. Install shading on the outside of the greenhouse for the greatest efficiency. A helpful device used to measure the proper degree of shading is a light meter. It will also be a valuable tool for the winter months. 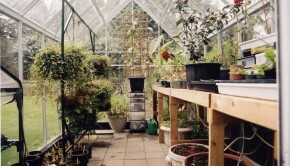 At the opposite end of the greenhouse shutters are necessary for fresh air intake. As the exhaust fans draw air into the greenhouse, the shutters automatically open or they can be opened and closed with a shutter motor. Added moisture is necessary to help cool a greenhouse during the hottest time of day. 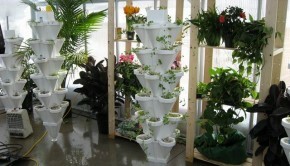 A quality misting system will spread the water evenly without soaking the plants. Spraying is generally takes place every hour. 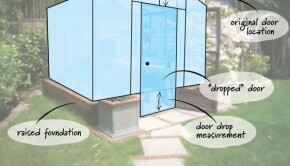 Along with misting, it is recommended that the floor of the greenhouse be soaked with water with a sprinkler. A more efficient system is to provide an automatic misting nozzle. The nozzles can be strategically placed in front of fresh air intake vents. Misting should only take place during the hot daytime hours to avoid too much night time humidity, which promotes disease. Using a timer to shut off the misting system two hours before sundown will alive ate any potential problems.